Always FREE Since 2008 ! Home / Archive by Category "Antennas"
Do you remember a few times in your life thinking that someone might be thinking what your are thinking? Though we are at the bottom of the worst sunspot cycle in my life (6 decades) I still check the higher bands before I warm up the key. Many times throughout 2018 when I checked to see if 10, 12, or, 15 meter bands were open I would not hear a single CW signal but there would be multiple +20 signals amongst the “digital” frequencies. Shouldn’t +20 dB from stations that brag about being able to run less than 5 watt be proof that the band is open? Yes! So I call CQ for 15 minutes and not a single reply. How could this be? I occasionally pondered various hypotheses. Today, I accidentally discovered that Kirk Kleinshmidt had written a very good explanation of this situation in early 2018. The article has been posted, with permission, by EI5DI. Did Joe Taylor K1JT Destroy Amateur Radio? RF Connectors; what frequency range for connector type? Starting a new project and you are wondering what RF connector would be most appropriate? Found an interesting webpage that has a simple, quick, clear, chart which shows us the maximum frequency range for many types of RF coax connectors. Click the link to get to the webpage for RF & Connector Technology webpage for connector frequency ranges. Another possible cause of T.V.I. ? “T V I” means Tele Vision Interference. The most common causes of TVI are bad powerline insulators, poorly designed LED bulb circuits, poorly designed transmitters. And, sometimes, the receiver is just overloaded by a nearby strong transmitted signal. I think I found another source of TVI when I stopped in Douglas, Wyoming and spotted this. It’s just a cellphone snapshot, I wish I had a better image for you. But in the center of the image you can see a UHF television receiver antenna…. and it is mounted directly to the radiating element of an 11 meter CB transmitter antenna. The goal was to home-brew the most efficient multi-band antenna possible for my aging aluminum bodied motorhome. 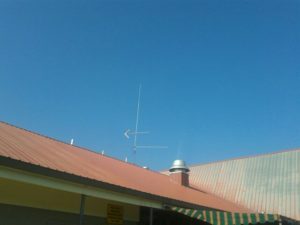 But the result was an antenna that worked well with 1 milliwatt and refused to work with 10 watt or more! Uranium from the Ocean ? Get your own wordpress blog and website from JTK Communications JTK Communications manages updates and backups for you.